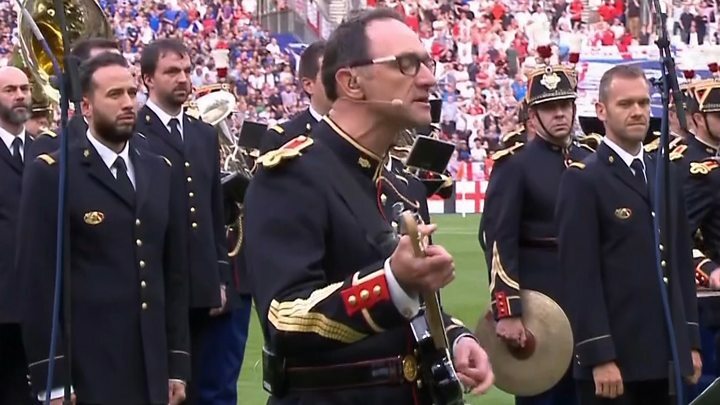 French football fans sang God Save The Queen ahead of the match between France and England in tribute to the victims of attacks in London and Manchester. After the Paris attacks in 2015, England fans sang La Marseillaise at the game against France at Wembley. Prime Minister Theresa May and French President Emmanuel Macron attended the match in Paris after holding talks. The Oasis track Don't Look Back In Anger was played by the Republican Guard at the Stade de France. Fans held up red and white placards to recreate the Flag of St George, and a minute's silence was held with players from both sides lining up together. The British national anthem was played second - the anthem of the home team is normally second in international fixtures. England manager Gareth Southgate said: "We are very grateful to the French for offering this tribute to England as a country. "It's nice that the history between us doesn't come between us at those moments." Similar tributes took place when England played France at Wembley in November 2015 just days after the terror attacks in Paris. Discussions between Mrs May and Mr Macron were expected to centre on counter-terrorism. Eight people were killed and 48 injured when three attackers drove a van into pedestrians on London Bridge then stabbed people in Borough Market on 3 June. Twenty-two people were killed and 116 injured by a suicide bomber at an Ariana Grande concert at Manchester Arena on 22 May.